Scientists have worked out the best way to dry your hands – and paper towels win, erm, hands down! 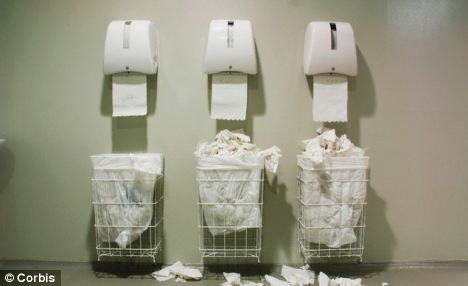 It appears that paper towels not only dry hands quicker than electric driers, they are also more hygienic. 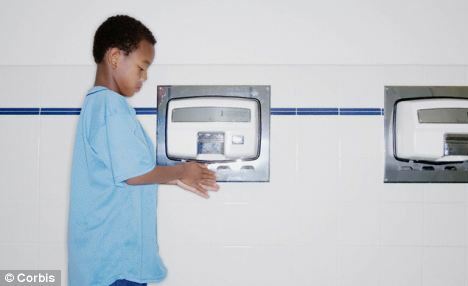 While the importance of washing hands is obvious, the benefits may be undone if they are not dried properly, experts said. This is because wet hands are better at passing on germs than dry ones, biomedical scientist Cunrui Huang said. His review of 12 studies found that, overall, paper towels were ‘superior’. One study found they leave hands 96 per cent dry after just ten seconds. After 15 seconds, the hands are 99 per cent dry. Are farm animals to blame for the rise of superbugs? Cloth towel rolls were marked down because of the sheer numbers of people using them. Although antibacterial washes are essential in high-risk environments such as hospitals and beneficial on cruise ships and on planes, they are not necessary in daily life. Previous studies have shown that hand dryers are often contaminated by bacteria in the outlet nozzle and the heat from the dryer is the perfect temperature to encourage their growth. Keith Redway's research has shown that disposable paper towels remove 58 per cent of bugs and cotton roller-towels 45 per cent. 'The message has to be to wash and then dry your hands thoroughly, using paper towels, not the hot-air dryers, explained Redway.